After the disappointment caused by the lack of a new Mercedes Benz G Glass 2013 at this year's New York Auto Show, the Mercedes Benz G Class 2013 has finally showed up on the radar and is now preparing itself for a US debut in August. The new G Class features minor modifications in terms of exterior design, but that was pretty much to be expected from this particular SUV. Under the hood on the other hand, is a totally different story. The Mercedes Benz G Class 2013 comes with several engine variants, two of which bear the AMG badge. The smaller and more eco-friendly engine is a G350 BlueTec 3.0 liter V6 diesel engine which develops 211 horsepower and 398 lb-ft of torque. In addition a 5.5 liter V8 engine able to produce 388 horsepower and 391 lb-ft of torque has been made available Both the 3.0 liter and the 5.5 liter are mated with a the same seven-speed automatic transmission. However for the G Class 2013, Mercedes introduced a couple variants for those of you who would like a more powerful SUV. The Mercedes Benz G Class 2013 will also be available as a G63 AMG, sporting a twin-turbocharged V8 engine able to produce 544 horsepower and 560 lb-ft of torque. As with the 5.5 liter engine, the G63 AMG twin-turbo V8 is coupled with a seven-speed automatic transmission. The fourth and most powerful choice will be the G65 AMG, packing a 6.0 liter twin-turbo V12 which develops 612 horsepower and an astonishing amount of torque, 737 lb-ft in fact. New equipment made available for the Mercedes Benz G Class 2013 includes Parktronic, Blind Spot Assist and an updated ESP system featuring Trailer Stability Assist and a "hold" function. 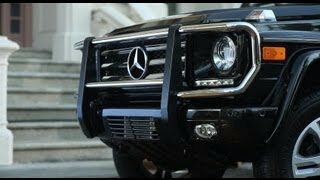 Performances aside the exterior modifications brought to the Mercedes Benz G Class 2013are shallow to say the least, the most obvious feature being a row of LED lights under each headlight. Furthermore, slight modifications have been brought to the bumpers and the shape of the mirrors. On the interior the Mercedes Benz G Class 2013 is a bit more generous in terms of upgrades and now offers higher quality materials, a brand new center console bearing a more modern look, redesigned instrument cluster and a brand new steering wheel just to name a few. As far as availability goes the new G Class will hit the German markets starting June while the US market will have to wait a couple of months longer. 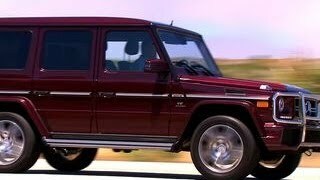 Information regarding the price is scarce but reports indicate that the G65 AMG will have a base price of roughly $347,000. We'll have to wait and see how the Mercedes Benz G Class 2013 will cope against the BMW X5 and the Audi Q7.